A couple weeks ago my husband brought home a box of 200+ outdated business cards for the kids to play with. Wonderful idea! In the days that followed, I found those cards in the couch, the toilet, and under the rug. 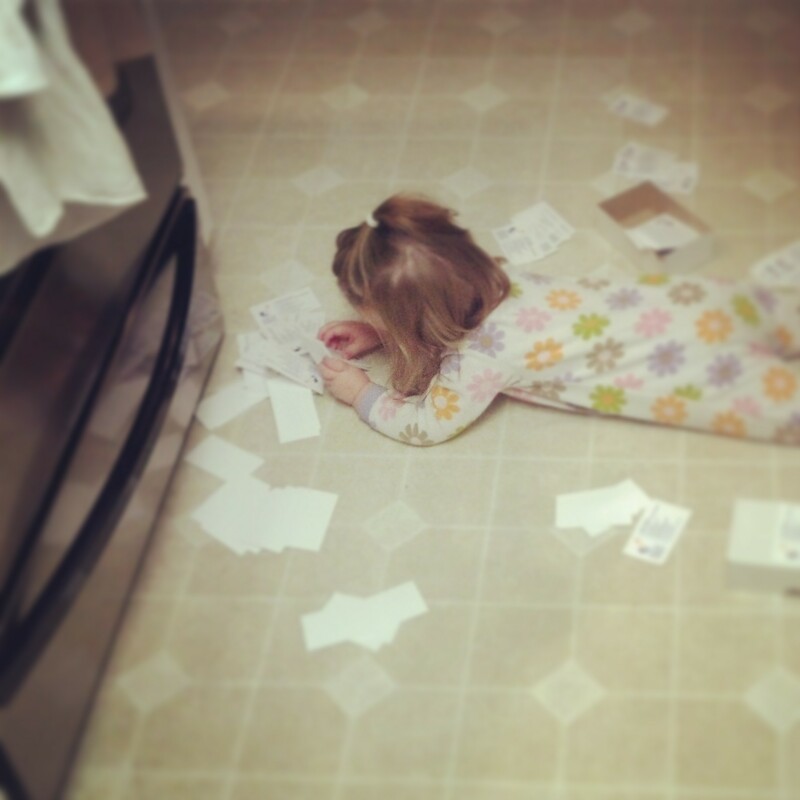 This is my youngest swimming amidst a sea of cards on the kitchen floor. How many do you think she managed to slide under the stove before I showed up? My guess is no less than 10. My house has been bursting at the seams with mounds of junk in the form of “toys.” A stash of paper airplanes from 3 months ago, a plastic whistle from a birthday party, a beaded bracelet from the neighbor, a mysterious piece of wood, a bunch of rocks, empty boxes, all forms of craft projects (multiplied by 1000). And business cards. Lots and lots of business cards. We didn’t actually purchase most of these things, so where does it all come from? How did these toys accumulate so quickly? Do they multiply when they get wet, like a Gremlin? And most importantly, will anyone notice if I burn them in a pile in the front yard? I have been on a cleaning bender the past few weeks, and am happy to say I’ve made progress. It feels good to purge, but now I’m trying to set limits for future junk accumulation. Otherwise I fear we are on a dangerous path to becoming the family that cleans the neighborhood with our trash grabber, and then returns home to dig through the garbage in search of new toys. This entry was posted in Uncategorized and tagged hoarders, toys and trash by BananaWheels. Bookmark the permalink. Oh my goodness. The junk. We live in the same house. My MIL (who I adore) loves to send the kids packages, but there’s always a package within the package full of junk: trinkets, costume jewelry, McDonald’s toys from when her youngest (now 20) was a kid…I take about half of it and immediately chuck it. The last one had bamboo ka bob skewers! Wtf??? Just what every child wants under the Christmas tree – kabob skewers. I’ve seen those! They are cute, but I don’t think I can pay good money to decorate my garbage. Something doesn’t feel right. So of course instead I tried to make one of those myself at home – the pig milk carton – and it was a disaster. My son built an elaborate condominium complex out of empty kleenex boxes that he named “Fort Squirrel”. He and my daughter played with it for hours with little plastic animals. They made little dishes and furniture out of Crayola Model Magic when we were on a car trip. It was a sad, sad day when we finally send Fort Squirrel to the trash can. Sad for me, anyway.